ICC allows creation of profiles with up to 15 channels. Consequently, ColorAnt allows the user to load and save test chart measurement data with up to 15 channels. If data with more than 15 channels is to be loaded, a warning is displayed as such data cannot be opened. Note: This does not affect spot color data. It is still possible to load spot color measurement data containing thousands of colors. The Custom Chart tool now automatically adds redundant patches for paper white and primaries in generated profiling test charts. This allows better verification of printer stability and results in better averaging and redundancy correction of profiling test charts. Redundant patches are added only in medium and large size profiling test charts containing 2 or more channels.. Note: We recommend to randomize the patches over the entire layout of the test chart using the Export Chart tool with Patch distribution set to Randomize before printing. The Report feature now sorts the ICC profiles in the drop down menu under Compare with print standard (profile) by percentages with the highest match on top. The labels of generated test charts from Export Chart are now consistent with the display of the Measure Tool and the data exported by ColorAnt. A new warning message has been added in the History Log for Edit Primaries in case manually entered Lab values cannot be realized. The reason is that some Lab values are no real colors and do not have a spectral equivalent. Support for the X-Rite Ink Master file format (MIF) of the X-Rite ColorMaster software. ColorAnt can import such data but can’t export it as *.mif. Export to other supported file formats (see online help Main Window/File) will work. A special feature in CGATS files is that they can contain different specifications in one file, e.g. measurements from different test charts or different color spaces. ColorAnt now supports multiple tables in CGATS files. A typical use case would be the export of various spot color Lab values from the Spot Color Report feature in ZePrA and their import to ColorAnt for further inspection. The display of channel names under Optimize Output Values in the Color Editor tool has been changed from rows to columns. This provides a view consistent with ZePrA and other channel tools. With the new function Include black gradient in export, the black gradient can also be exported. Typically, when exporting CxF/X-4 data from a complete test chart, only 100 % black and overprinting spot colors with 100 % black are added, but not the black gradient. However, adding the black gradient can be very helpful when using CxF/X-4 data in Edit primaries or other tools to extract the black information. Note: The CxF/X-4 specification does not explicitly prohibit this, but the original idea is to specify spot colors rather than black. Therefore, activating the checkbox could cause incompatibilities with programs from other manufacturers. 1. Transfer of data to the calling application (e.g. ColorAnt, CoPrA or ZePrA ) has been improved. After measuring a test chart users can now decide to transmit the measurement data to the calling application with a new button or by closing the Measure Tool application. The Transfer measurement dialog will not appear automatically any more as in previous versions, which brings several advantages. 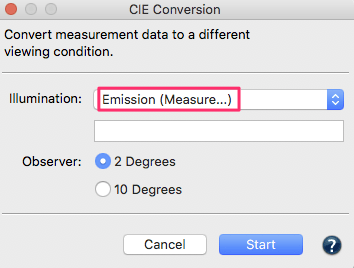 The new transfer dialog allows to either Transmit the data and close the Measure Tool, or to Dismiss the data and close the Measure Tool, or to go Back and remeasure the chart (to correct faulty measurements, for example). 2. Some instruments can now apply combined measuring conditions (such as M0, M1, M2 and occasionally M3) in one measurement operation. Supporting instruments are X-Rite i1Pro2, iO with i1Pro2, eXact and Konica Minolta FD-9. For such instruments the drop-down menu Condition has a new option to select all appropriate measurement conditions. More details about the instruments can be found in the online help. If applied, the measurement data of all measurement conditions will be transferred to the calling application. ColorAnt then allows the loading of individual measurement conditions or All available color specifications. In the latter case, multiple data sets are loaded with the measurement condition appended to the file name for easy recognition. 3. The Measure Tool now supports the Barbieri LFP qb measuring device. Fixed that the channel filters under View Options in the View dialog work properly for RGB files. Fixed: RGB data is now displayed correctly under View in the 2D and 3D tabs. It is now RGB rather than CMY. Note: The tabs TVI and Curves still show CMY channels which is correct for this purpose. Fixed an issue when changing the printing sequence in the Edit Primaries dialog. Fixed: It is no longer possible to drag and drop data into ColorAnt as long as a dialog is open. Fixed an issue with the Coefficient of Variation under Compare/Statistics showing random values in case of nearly 0 deltaE differences due to rounding issues. Fixed preview pane in Export Chart displaying incorrect color for 1CLR and 2CLR reference files. What’s new in ColorAnt 5? ColorAnt 5 is a major upgrade containing many new features and improvements of existing tools requested by customers. ColorAnt 5 makes the newest standards, like ISO 20654 (SCTV) or CxF/X-4, more accessible to users and includes even more powerful tools that color managers will find beneficial. In addition, on macOS systems ColorAnt 5 runs in 64 bit mode making it future proof for recent and upcoming macOS versions. 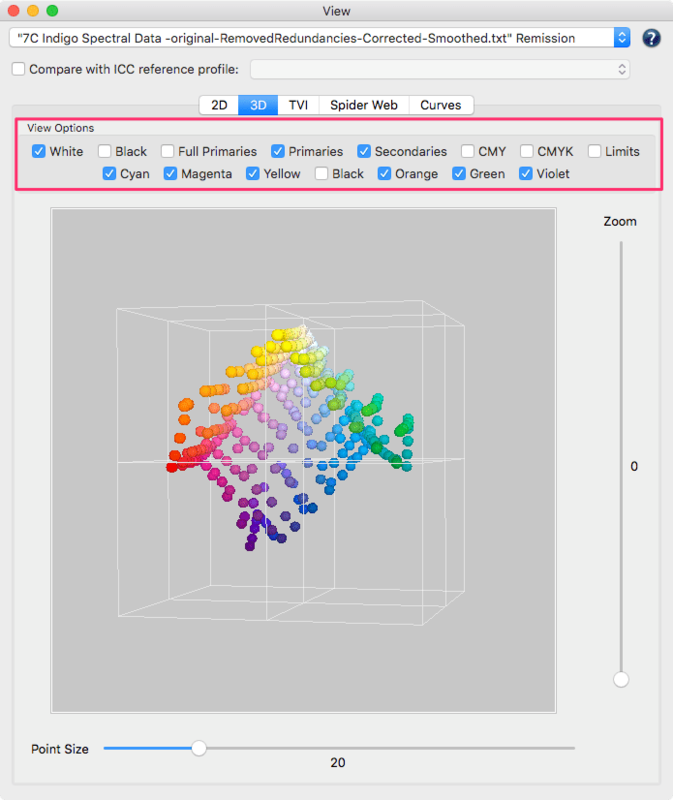 ColorAnt 5 features a powerful new color editing tool. It can be used to edit color patches and to process color conversions of spot colors. 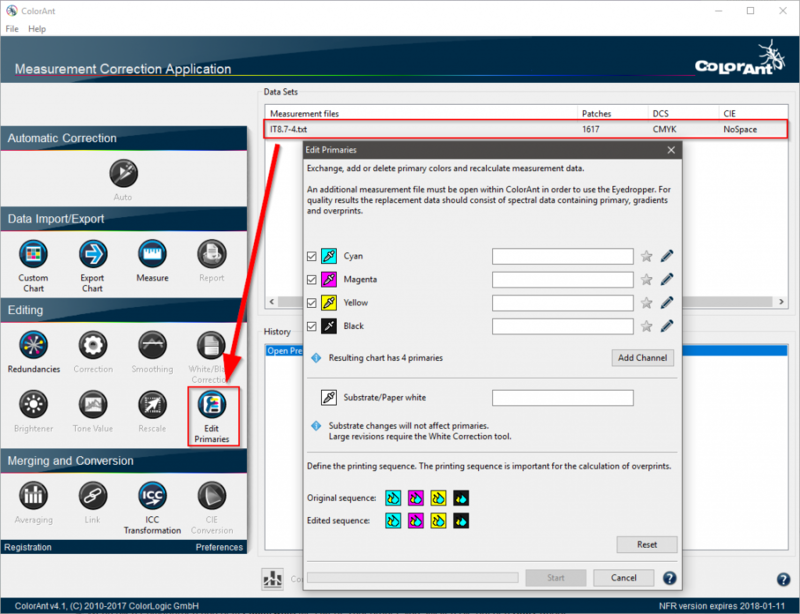 Some of the new features will look familiar to ColorLogic ZePrA users who already know the advanced spot color conversion of our color server. Edit patch names, Lab values (CIE) or device color values (DCS). Convert and optimize a complete spot color library to a target profile for RGB, CMYK or Multicolor. To convert spot colors to a desired target ICC profile, first load the measured spot colors into the ColorAnt Data Sets section, e.g. a Pantone spot color library (or any supported file format such as CxF), then click on Color Editor. The appearing window contains a scrollable table on the left showing all spot colors of the file and the editing options on the right. Select an ICC Profile from the drop down list and a calculation Mode. The preset dE00 Limit highlights colors in the table with a warning icon that exceed the threshold defined by the user. 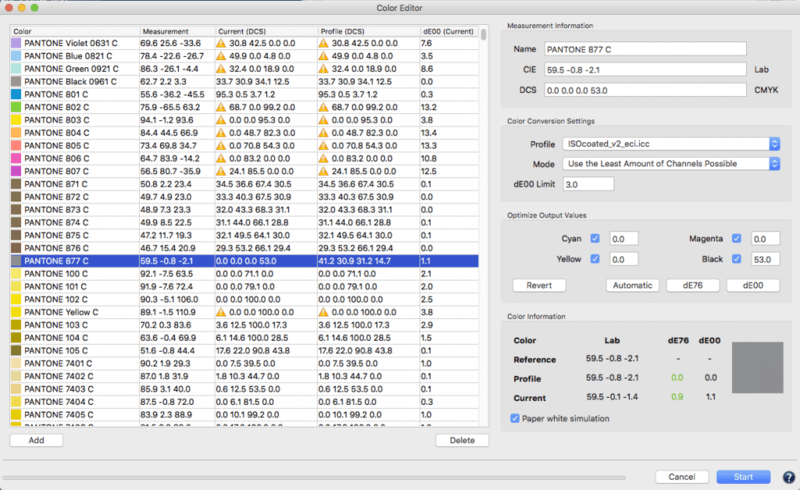 If a color is selected from the table, the device color values for each channel of the selected profile are shown under Optimize Output Values and the deltaEs are reported under Color Information. As a default, the device values calculated via the ICC profile are shown without any optimization. By clicking on dE76 or dE00 the deltaE can be minimized for each color. 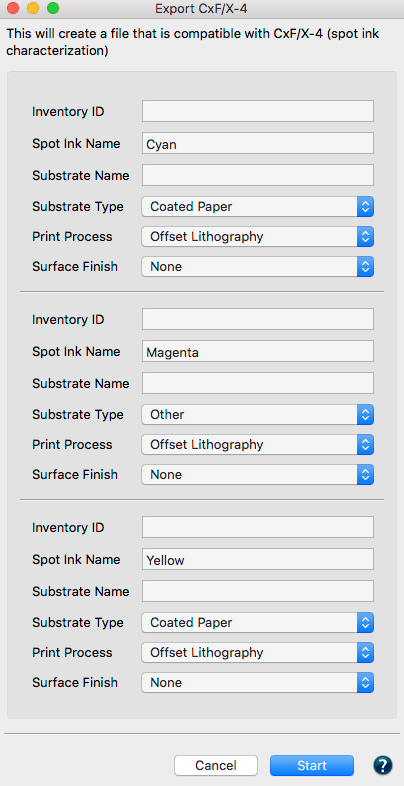 Clicking on Automatic applies the selected ColorLogic calculation Mode which typically results in a reduced amount of channels for better printability. Users can optimize each individual color or a bunch of colors and can even enter device values manually. Single or multiple colors can be selected and optimized. By clicking on Start, the entire list of colors is generated in the Data Sets section including the calculated and optimized device color values. Those values can be saved for further usage in other applications in any format supported by ColorAnt (CGATS TXT and XML, CxF3, Adobe ASE and ACO, named color ICC profile or GMG CSC). Note: ColorAnt 5 supports the Adobe Swatch Exchange format ASE. The CxF/X-4 file format for spot color characterization is gaining momentum in the industry. Previous versions of ColorAnt already supported the export of data in this format and were able to extract spot color information from PDF files be it CxF/X-4 or others. Version 5 features a new tool in the Data Import/Export section which allows CxF/X-4 spectral information to be embedded in PDF documents. 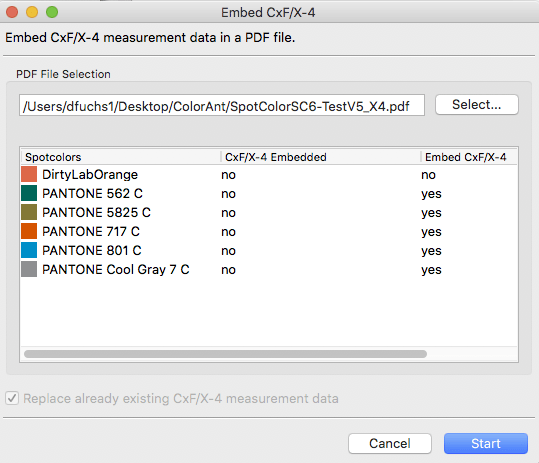 To do so, first select the CxF/X-4 measurement data, then open the Embed CxF/X-4 tool and select a PDF/X file with spot colors to embed the selected measurements into. The tool lists all spot colors of the PDF/X file, checks for spot color names that fit those of the CxF/X-4 measurement data and warns in case of conflicts. Only if the spot color names of the PDF file fit those of the CxF/X-4 file will the spectral data be embedded when clicking Start. ColorAnt’s History feature is a helpful tool that records every editing step. It allows the user to switch between different processing states of a file. After some editing and data optimization with various tools users often cannot remember the settings (slider settings or options or files) used. The new Save History Log – available at the bottom right of the main dialog – saves all activities that have been applied to all files as a comprehensive PDF document. In addition, when double-clicking an entry of the History section a dialog pops up showing the settings applied to the data at this specific step. This single step can be saved with Save Log. The new log feature has an additional advantage when averaging files using the Averaging tool. The averaging log contains a detailed report with sample colors (known from our general Report feature) comparing the averaged data to all files and providing useful statistics for process control such as standard deviations (sigma, 2 sigma, 3 sigma) for Density, dE and dH/dL. This allows the user to recognize colors with large deviations which would not be so obvious by just looking at the values in the averaged file. The Tone Values correction tool which corrects data according to different technologies like G7 or ISO 20654 has been improved. 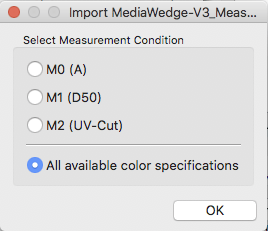 For multicolor data, a fourth option was added which only adjusts the multicolor channels to ISO 20654 and leaves the CMYK channels untouched: ISO 20654 (Multicolor). This is a useful option for those who have calibrated the CMYK parts according to other standards, like PSO density curves or G7 and just want to adjust the additional multicolor channels to match ISO 20654 (SCTV) requirements. In addition, a Protect Lights slider has been added which was previously available in the Correction and Smoothing tools. This helps users to leave the highlights untouched when applying G7 or ISO 20654 corrections. It is especially helpful for Flexo customers as it avoids over compensation of dot gain in the highlights. When viewing measurement data, the View Options in the 2D and 3D tabs have been updated with additional color channel checkboxes for the primary colors available in the loaded data set. The color channel checkboxes can be combined with the above color filters so that only the Multicolor Primaries or Secondaries can be shown. This greatly facilitates finding and viewing patches. The removed viewing options, Duplex and Triplex known from previous versions of ColorAnt, can be compensated by selecting appropriate color channels individually (e.g. Cyan + Black shows duplex combinations and Cyan + Magenta + Black shows triplex combinations). Both options were removed to gain space in the user interface. In addition, the filters work in combination with the color channels. If, for example, the checkbox Secondaries is enabled, the checkboxes Primaries and White are automatically enabled. They can be disabled if only two color combinations (Secondaries) are to be highlighted. The TVI tab allows users to switch between the typical density based dot gain curves according to Murray Davies or the modern colorimetric dot gain curves according to ISO 20654 (SCTV). 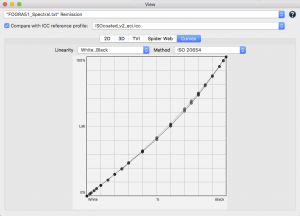 Linear dot gain curves according to ISO 20654 would show a straight horizontal line. The Curves tab now allows the user to view the linearity curves of all or single primary gradations in a single graph. In previous versions, only a single curve of one primary was shown. Switching between Curves and TVI tabs allows users to view either the tone value increase (TVI) curves or the input-output value curves based on the Method chosen under Curves. A linear dot gain curve according to ISO 20654 would show a straight 45 degree line in the Curves graph. The CIE Conversion tool allows to convert spectral remission data with a different Illuminant and a different Observer angle. It is now possible to directly measure the ambient light using supported instruments (X-Rite i1Pro and Konica-Minolta FD-7) from within the CIE Conversion tool. The Measure Tool v2 – which can be started from within the tool – supports a new ambient light measuring mode. In previous versions, an external application had to be used for measuring and saving ambient light measurements. The measured ambient light reading can be saved separately for later use. In Measure Tool v2 and higher a Measure Mode has been implemented. This allows to switch between Ambient Light Measurement mode with suited instruments and the standard Reflectance Measurement mode. If an instrument such as X-Rite i1Pro and Konica-Minolta FD-7 supports both modes a light bulb button is shown in the user interface. Clicking on this bulb button will switch between the modes. Alternatively users can switch the mode in the file menu Measure Mode. Various improvements and better support for the instruments (X-Rite i1iO and Konica-Minolta FD-9) have been implemented. For example will the Export Chart tool save chart, patch and gap sizes and Measure Tool reads such information for easier set up of the instruments measure wizards. This way user intervention can be minimized leading to less errors when measuring. 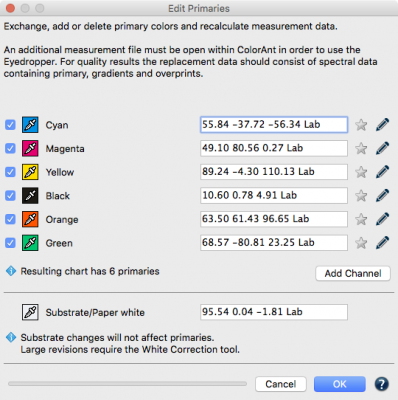 The Edit Primaries tool extracts a wide range of measurement data from a selected data set via the eyedropper functionality, such as the full tone, the gradient and overprints on black – all spectral data of course but Lab is also supported. If the selected data contains color overprints with other primaries, such as secondary colors, this will now be taken into account, too. The new checkbox Adopt Secondaries allows the user to take advantage of those additional measurement data. The option is only enabled if secondary colors are available in the picked data set and at least two colors are exchanged. 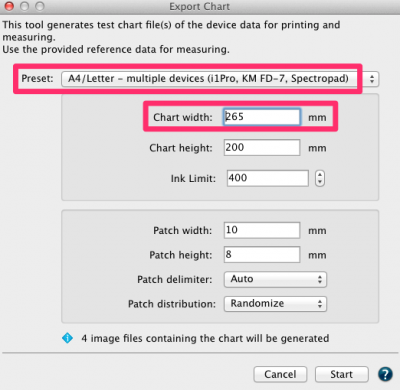 A tool tip indicates the selected overprints and the associated data sets. 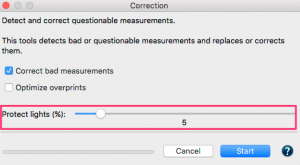 The option can be disabled if the measurement overprints are not suitable for the given data, in which case Edit Primaries will calculate the overprints itself. Using color overprints can improve the accuracy of the rendering and calculation of the spectral color model. The Custom Chart tool now allows to build test charts with up to 9 channels. This extension reflects the technology improvements in multicolor profiling recently introduced in CoPrA 5. 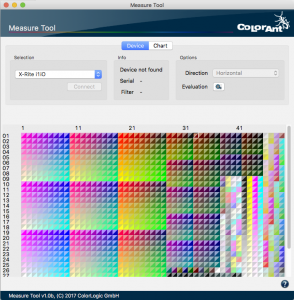 Using ColorAnt 5 it is possible to create multicolor test charts with two gamut extending colors in each color sector, e.g. a 6 color chart with CMYK+Red+Orange, where Red and Orange are two colors extending the gamut in the Magenta and Yellow color sector. 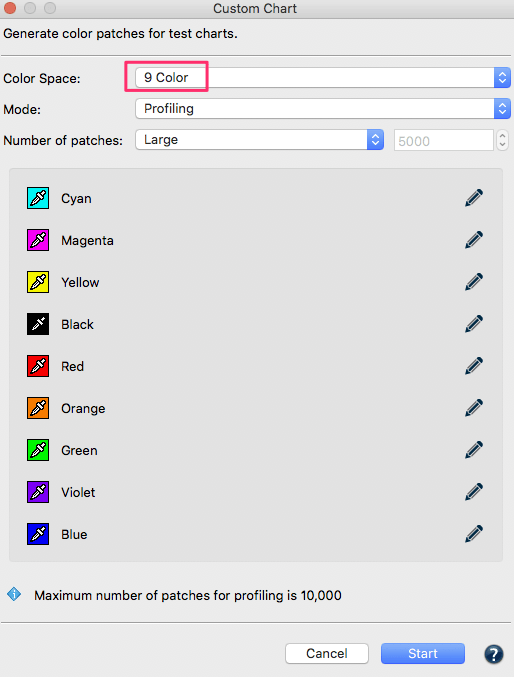 Additionally, several technology improvements regarding the distribution of patches – for example in the Flexo Profiling mode – and the addition of interstitial color patches for multicolor charts result in further quality improvements of the new Custom Chart tool. The main new addition to the Export Chart tool is a large preview section on the right. The preview shows the color distribution on each of the generated pages. This is quite powerful as it allows to recognize changes in Chart Dimension, Patch Sizes and the selected Options. 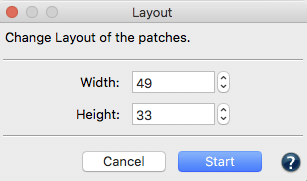 The Patch Sizes panel introduces a new setting to Prevent vertical gaps. Depending on the chart size this allows to fit one or more additional rows on a page. The preset handling has been optimized and a new sweeping broom icon has been added next to the drop-down menu Preset to delete edited presets. In addition a new preset for the X-Rite i1iO with a minimum patch size for single mode measuring has been added. The Report feature is a helpful tool to compare the measurement data to a selected profile and optionally to the best matching profile. When comparing profiles the matching accuracy is now shown for each profile of the drop down list in percent, so now it is much easier to find a profile that best fits the measurement data. In addition, the best matching profile will automatically be selected in the profile chooser if the Search button is clicked. A new Layout feature is available in the context menu of the Data Sets section for a selected measurement file. It allows the change of the rows and columns of a chart in terms of amount of patches in Width and Height. For example, in the Layout context menu users can define the number of rows of a chart. In addition, new context menu options to Add, Copy and Paste patches in the 2D View have been added. Along with the already available tools Edit and Delete this allows the fine tuning of single patches of a data set. Fixed some issues in the Edit Primaries tool that led to faulty results such as low contrast and dull colors or wrong lightness under certain circumstances. Note: This improves interoperability with external tools. Note: The channel sequence of a CMYK color space does not have to match the printing sequence. For example, the printing sequence KCMY is quite typical in web offset presses, however, the channel sequence should still remain CMYK as some programs can’t handle untypical channel sequences correctly. The quality of the spectral overprint model used in the tool Edit Primaries has been improved. Color characteristics are detected better using limited data resulting in better predictions. Shadow areas with and without opacity information are now calculated in a better differentiated manner. In addition calculations with spectral gradients have been improved so that the Rescale tool benefits from this, too. PDF test charts which are exported using the tool Export Chart now also have embedded fonts. This will prevent unnecessary error messages in RIPs or PDF preflight programs. Correction of index errors that occurred when trying to Link certain data sets and to create Reports. An error in the mode Flexo Profiling of the tool Custom Chart has been fixed which created tone values only from 1.6% instead of the desired 1.2%. Various minor errors which occurred when saving CxF3 or exporting to CxF/X-4 have been resolved. Now an undefined “Name Space” is stored correctly and no additional channel is displayed in the user interface for 1- to 3-channel data. A truncated error message has been fixed which occurred in the Export Chart dialog when selecting too small chart sizes. In the Registration dialog the link to the URL of the new ColorLogic website has been updated. When exporting test charts with 8 channels using the tool Export Chart the 8th channel has been exported as black. This error has been corrected. Note: Even if it is not yet possible to create reference files for test charts with more than 7 channels with ColorAnt 4.2, a correctly structured test chart can still be created from an 8-color reference file using Export Chart. Typically, the channel names and colors from the information of the reference file are used in this process. If this information is missing, it may result in unfavorable test charts and channel names may only be assigned generically, for example channels may be named Channel 1-8. When starting ColorAnt the splash screen sometimes superimposed and blocked other messages (for example, the update notification). This error has been fixed. The missing German translation for Gamut Volume in the Report has been added. Fixed that the chosen chart in Measure Tool did not transmit the file name. The naming and display of emissive measurement data has been fixed. Measurement data will be shown as Emission and not Remission any more. The way the random Patch distribution in the Export Chart tool works has been changed. If the Export Chart dialog stays open and no changes to any other option in the dialog have been done the exported chart will not be newly randomized each time it is saved in a different file format. Improvements have been added for patch size warnings on the i1i0. MeasureTool/CLi1iODevice: Added validation of patch height regarding minimum patch height. Updated translation strings. MeasureTool: Fixed writing Instrumentation data into measurement file. 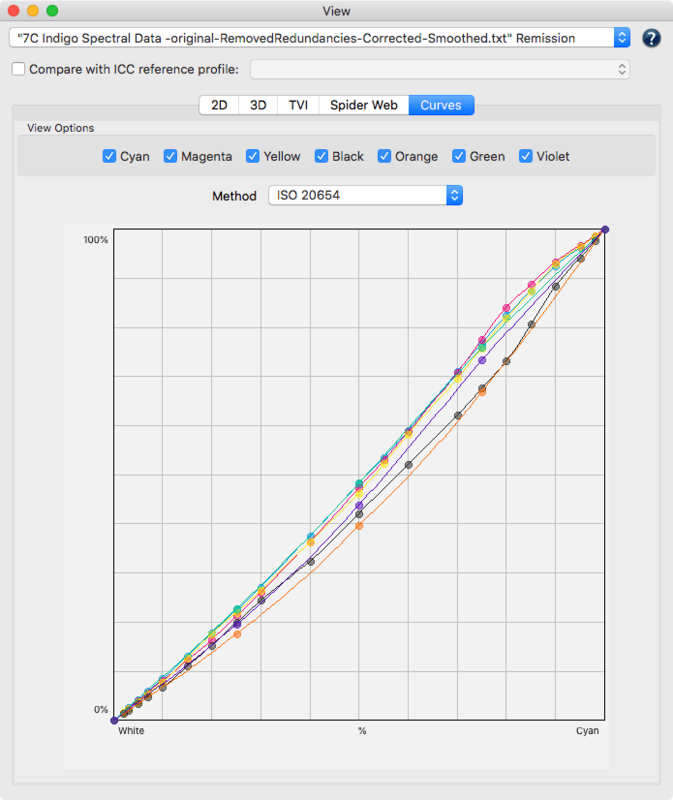 Include MeasureTool log file when saving ColorAnt support data. Fixed a severe bug that occurred when trying to import CGATS XML files. Stronger smoothing in some cases. Fixed FD-9 plugin not loaded message when starting Measure Tool on a Windows installation without previously installed FD-9 driver (Ticket #170178). Fixed an Index Error in the White Correction tool that occurs with picking measured data using the eyedropper. Now all measured data will get the name extension measured for better differentiation between the reference data and the measured date. A bug in the White Correction tool in combination with XYZ measurements has been fixed. Fixed channel naming issue and corrupted file with multicolor TIFF files after exporting with the Export Chart tool. The Edit Primaries tool has been updated to allow the assignment of new color values to device values (DCS values) which do not already contain color values. Thus, new characterization data can be created which is based only on existing wedges of primaries or on the input of Lab values. There is no longer a need to reprint test charts. If measurement values are assigned to all primaries and the paper white, and click Start. A feature to automatically optimize and remove redundant color patches has been added to the tool Export CxF/X-4 in the File menu (to save CxF/X-4 compatible measurement values). 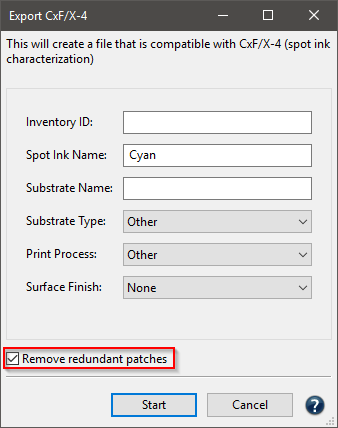 If the checkbox Remove Redundant patches is activated all required color patches will be saved only once in the exported CxF/X-4 file, avoiding duplicates. The Measure Tool now remembers the last used settings of each measuring device. When using the X-Rite i1iO, measurement table older i1Pro measuring devices (Revision A-D) are now supported as well. 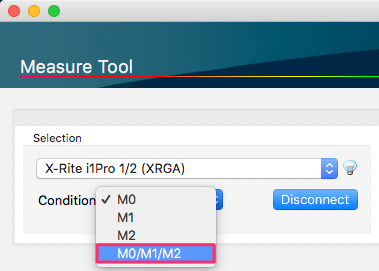 For measurements using X-Rite i1iO with newer i1Pro measuring devices (Revision E) the default setting is now M0 (Dual). In previous versions, the default setting was M0 (single) which resulted in slow single patch measurements if users did not change the setting manually. Measurements of multi-page test charts using the X-Rite i1iO are working properly under MacOSX. An error has been resolved in which a recurring message appeared when the drop-down menu for the measuring direction has been selected during a measurement using the Konica-Minolta FD-9. Several messages have been translated. The option Randomize of the feature Patch distribution has been revised and now works with multi-page charts. Additionally, remaining white patches are no longer listed at the end, but will be spread across the chart. Furthermore, light measurement patches at the edge of the chart are also avoided. These measures increase the measurability of such charts especially if Patch delimiters are not activated. An error has been resolved in which the size set in millimeters in Patch delimiter was not transferred correctly into the created chart. An error has been resolved in which the target definition for basICColor catch was not generated despite the option Create Target Definition for basICColor Catch being activated. The minimum Patch height for strip measurements of test charts using the X-Rite i1iO has been corrected to 7.5mm in the default Preset (Default – Minimum Patch Size). 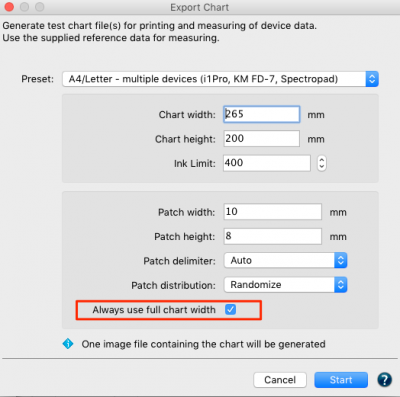 The Chart width and Chart height for measurements using the X-Rite i1iO has been increased to 320x230mm in the default Preset (Default – Maximum Chart Size). An error resulting in unusable color values or missing DCS values when saving some multicolor data as CxF has been corrected. The compatibility to CxF measurement values of different manufacturers has been optimized. The Correction and Smoothing tools had an error in the processing of measurement data which contained only color wedges of primaries. This has been corrected. Channel names have not been detected correctly in some 4CLR measurement data. This has been resolved provided that channel names are noted correctly in the document. In the tool Tone Value, it is now possible to apply Corrections according to ISO 20654 on 2CLR measurement values. The drop-down menu option Correction according to a tone value curve of an ICC profile in the tool Tone Value is now grayed out when no ICC profiles matching the measurement values have been found. This prevents inaccurate artifacts and error messages. The display of color space expanding colors of a multicolor comparison profile in the window Spider Web under View has been optimized. The colors of comparison profiles are now displayed brighter for a better identification of the measurement data. The import of spot colors from PDF files that don’t contain CxF/X-4 measurement data has been optimized. The Measure Tool supports additional instruments such as X-Rite i1iO, X-Rite eXact and Konica-Minolta’s ultra fast strip reader FD-9. Improved usability of the Custom Chart tool. We have added an expert system that provides guidelines for typical use cases such as creating linearization test charts, profiling test charts, special profiling test charts for Flexo printing and updating of profiles. The new options answer the typical question of how many patches should be used for a desired test chart. The Export Chart tool has added functionality to create printable test charts as PDF, TIFF or PSD files that are best suited for the supported instruments in Measure Tool. In addition individual settings can easily be saved and reused. The Edit Primary tool has been improved for better prediction of overprints using the new Printing Sequence feature. The previous White Correction tool has been updated to the White/Black Correction tool. It adds functionalities such as selecting the white point from another data set, improved spectral calculations and adding black point editing. The Tone Value tool allows correction choices for G7 and the new ISO 20654 methodology of colorimetric based linearities used for spot colors instead of density calculations. Even G7 + ISO 20654 is possible for Multicolor files with CMYK+spot ink channels. This is especially helpful to handle expanded gamut color including CMYK and spot color gradations. 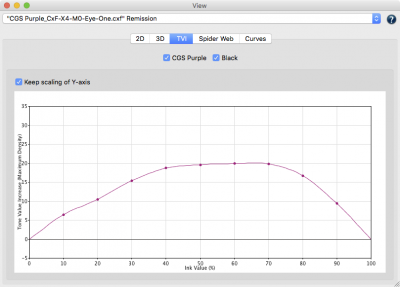 The Views have added support for comparing the Spider Web, 3D gamut ,TVI and Curves with another profile. Curves allows to compare TVI versus ISO 20654 (aka SCTV) curve shapes. There are several improvements to various tools such as the Correction tool, which has a Protect lights feature similar to the Smoothing tool. The new Averaging tool allows automatic application of redundancy correction after averaging, which ensures that this easily missed step is not forgotten. CxF file support has been improved and a new option to export spot colors as CxF/X-4 files added. In addition, spot colors as CxF/X-4 or Lab based can be extracted automatically from loaded PDF files. patches and test charts for Linearization purposes. After selecting the Mode you can select the desired Number of Patches from a drop down menu that allows to select either between small, medium or large or a custom amount of patches. The number of patches is dependent on the selected Color Space and Mode and will be displayed right next to the drop down menu. The Export Chart tool allows creation of test charts as TIFF, PSD or PDF files to be printed on a printer. The tool is optimized to work with most of the instruments that our Measure tool supports. The new Preset selection feature allows selection of presets for the supported instruments and typical page sizes. As each instrument has its own requirements for Patch Sizes, Distribution and Delimiters those settings are already preset for you to make things simpler. 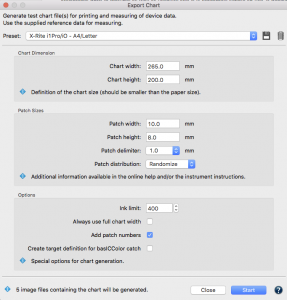 Changing settings including Chart dimensions and patch sizes to create test chart files for a particular printing space and instruments requirements is a simple task. Additional options are helpful for specific cases such as creating not only the test chart file itself but a XML reference file to be used for measuring the test charts with basICColor Catch as well. The Edit Primaries tool allows addition, removal and and exchange of primaries or the paper/substrate into an existing measured printer characterization data. In typical print production, adding or swapping ink(s) requires the of printing a full blown test chart. The Edit Primaries tool will simply require the spectral data of the new ink(s) to be added or exchanged to avoid printing of new test charts. Edit Primaries will not only exchange the inks but also recalculate all overprints based on intelligent spectral color models. A great new addition to the Edit Primaries toolset is the Printing Sequence feature. It takes the order of the inks printed on top of each other into account so that exchanging of primaries respects the position of the inks and adjusted overprint calculation is applied. As an example: There is a difference in color appearance if red ink is printed on top of yellow ink or if it is vise versa. Users can define the printed ink sequence independent from the channel order, so that the channel order can be retained as CMYK even if the printing sequence was KCMY. 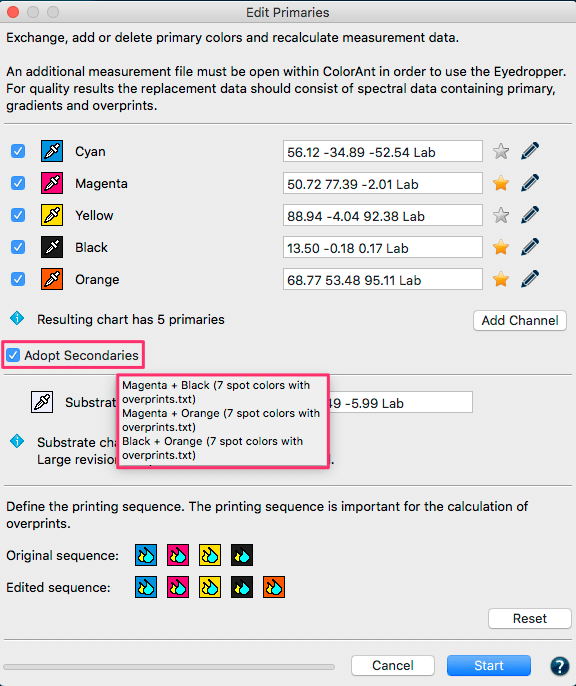 With the Printing Sequence feature, it is easy to evaluate a different printing sequence by simply moving the colored icons to a different position and recalculation of the data without actually having to print that new sequence. This tool allows to change the paper according to three different methods. 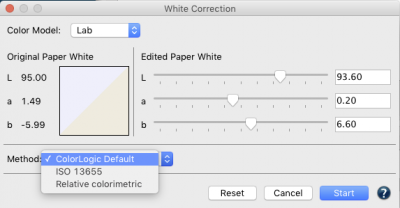 A new eye dropper feature has been added to the White Correction part to pick an other paper white from a loaded measurement data file. This makes adaptation of a given printer characterization data to a different paper white very easy. 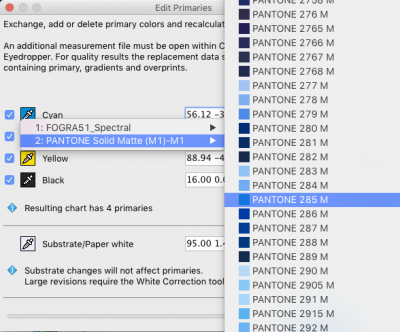 In addition, if both the characterization data of the printer and that of the different paper white are spectral data and the ColorLogic default method is selected, calculation is done with a spectral model leading to the best results. In addition, industry wide used Methods like paper adaptation according to ISO 13655 or relative colorimetric are available. Another new feature is the ability to edit the darkest neutral patch of the loaded characterization data under Black Correction. This can be helpful in cases where black has been measured to dark or to light compared to the visual appearance, which may happen in industrial applications like ceramics, textile, glass, etc. Users can change the darkest black, which will scale the entire data towards the edited black point. The Tone Value tool has been enhanced with additional options. It offers not only corrections according to G7 but according to ISO 20654 and even a combination of both now. With G7 Gray Balance, the tone value curves are calculated to match the gray balance requirements of the G7 calibration process. The G7 calibration process ensures that the CMY curves reach a neutral gray of defined lightness values throughout the entire gray balance curve. The new ISO 20654 methodology of colorimetric based linearity can be used for spot colors instead of density calculations but can be applied for CMYK, also. Using this method will make sure that the gradations of all primaries are colorimetrically linear. This can be verified using the View/Curves dialog and selecting the ISO 20654 viewing method. Note: Density based methods, like Murray Davis, do not work well for non CMYK colors. The IS0 20654 method also known as SCTV (Spot Color Tone Value) is an alternative method to handle tone values of spot colors. G7 + ISO 20654: G7 is defined to work with CMYK only. 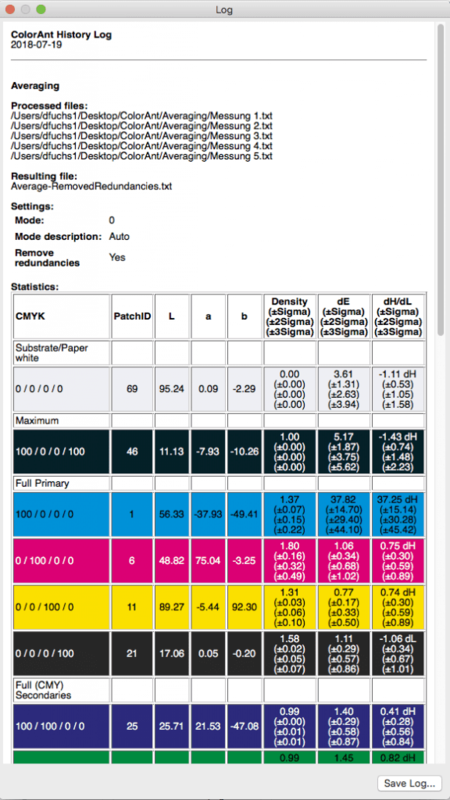 However it is possible to apply the G7 process on the CMYK parts of a multicolor measurement file and the additional (multicolor) channels will be corrected according to ISO 20654. The Curves tab displays the linearity curves from white to 100% of all primary colors including multicolor data and in case of CMYK data, the secondaries also The smoothness of gradation curves can also be displayed using three different methodologies. 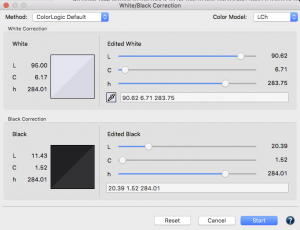 Three different methods can be selected: ColorLogic Default is the default option. ColorLogic Default: views the curves in colorimetric linearity based on Lab /dE-76 and means that for example a 50% value of a given primary has the same distance to left value (white) and the right value (full tone) if it sits at the midpoint of the graphic. Nowadays modern RIPs linearize primaries based on colorimetry methods. A fully linear curve (45 degrees) points to a perfect colorimetric linearity. ISO 20654: The new ISO 20654 methodology can be used to display how the gradation curves of primaries look like if regarded under the aspect of colorimetric linearity. A fully linear curve (45 degrees) points to a perfect colorimetric linearity according to ISO 20654. Note: Density based methods like Murray Davis do not work well for non CMYK colors. The IS0 20654 method also known as SCTV (Spot Color Tone Value) is an alternative method to display tone values of spot colors. Tone Value (Density): is the tone value curve based on density. It’s a different view of TVI diagrams. We have added this view for a better comparison to colorimetric methods. By using Compare with ICC profile you may choose a profile for comparison of the curves in the DropDown menu. The Correction tool has a new Protects Lights feature that allows selection of which percentage value the correction shall be performed. Values below this slider are protected. The slider values ranges from 0% to 50%. Features for flexographic printing: The flexographic print processes often exhibits a bump curve in the highlighted area. These types of curves can be retained by using Protect Lights. Use the slider adjust unwanted changes in the highlights after correction. 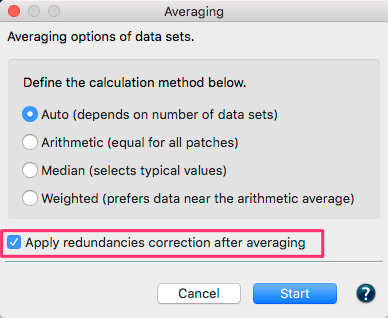 The Averaging tool has a new option, Apply redundancies correction after averaging.This feature is enabled by default and is helpful if a chart contains redundant patches since they could still be different in the averaged file. Using this option saves you the extra step of a using the Redundancies tool after averaging. The File menu offers an Export CxF/X-4 option. It extracts any primaries, including gradations and overprints on black and saves this as a CxF/X-4 compatible file. Such a file can be used in other tools to integrate in a PDF file or it can be loaded into a spot color library in the color server ZePrA for conversion of spot colors. The Export dialog offers possibilities to enter meta data in the exported file such as Printing Process, Substrate Type, Finishing and others. 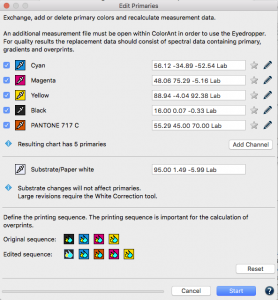 In addition, ColorAnt 4 allows extracting of any spot color from PDF files. 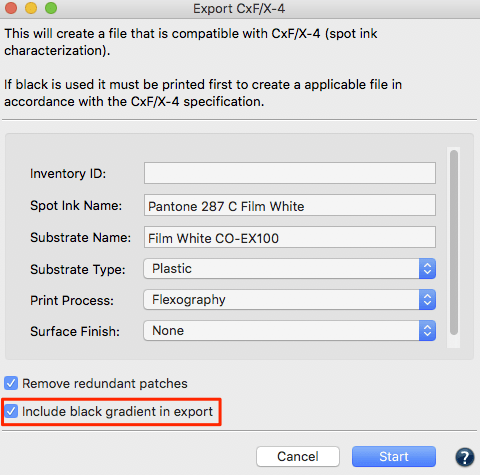 Simply drag and drop a PDF file with spot colors in the Data Sets section and all spot colors, be it CxF/X-4 or those with alternate color space, will be loaded as separate files. This is a helpful feature to examine the color values of spot colors used in PDF files or to extract such values to be used in other tools. 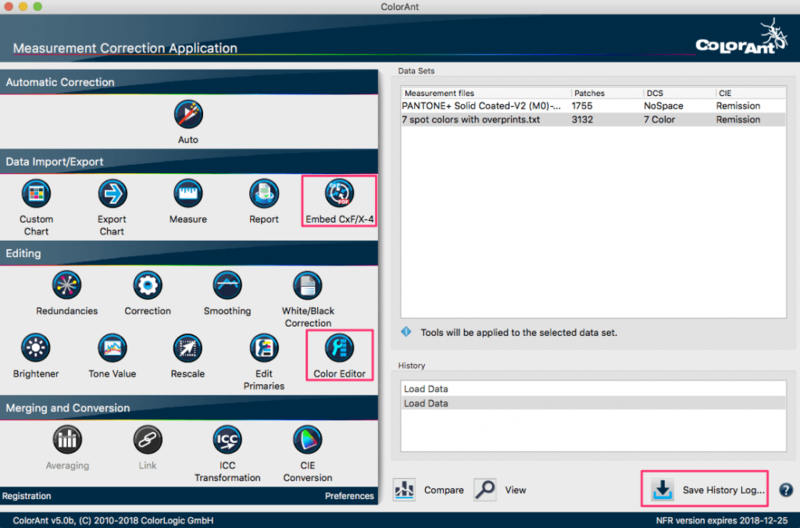 The installer of ColorAnt 3.2.2 comes the latest version of UPPCT v2.3.5 that supports X-Rite eXact instrument. The Comparison tool has been optimized. It not only shows the Lab values of the selected patch and the delta E but the device values (DCS values). This is useful for analysis in cases where DCS values have been changed. An error has been fixed in the Link tool when combining CMYK and multicolor files in combination with a license error. Renaming of channels with Edit Primaries has been fixed in cases where files contain differing white patches that have not been optimized for redundancies. The Windows version of the Export Chart error that multi page PDF test charts couldn’t be exported has been fixed. Manual editing of a channel via typing in a new LAB value does work again in Edit Primaries. In the previous version the LAB values did not change. Fixed a crash of ColorAnt when saving an XML report with a comparison profile enabled in the report settings. Fixed Argument Error in case of exporting 4CLR charts with Export Chart tool. In addition it is possible now to export PDF files for multicolor testcharts without CMYK components. Optimized handling of mixed spectral and Lab data in Edit Primaries tool leading to better overprint and gradations calculations. The quality of the core technologies Correction, Smoothing and Rescaling has been improved. For example Smoothing with a 100% slider setting is behaving stronger now compared to the previous version and still more accurate. Improvements to Export Chart: the distance between the numbering of the rows and the first patch on that row in the exported tests charts was increased. This makes measuring these charts with certain instruments, e.g. Konica-Minolta FD-7 easier. Note: The instruments head should not be placed on any of the numbers or incorrect readings will result. Make sure to place the instrument on the blank space between the numbering and the first patch of a row. Support loading of measurement data from ICC profiles using the CxF tag for storing measurement data. E.g. X-Rite i1Profiler saves the measurement data this way. Note: Some profiling tools save the measurement data needed to build the ICC profile within the profile. A standard tag for this is the TARG tag. ColorAnt is able to load such data from ICC profiles if available and will show an error message if no such data is existing. The spider web diagram allows to select RGB working space profiles (e.g. AdobeRGB or sRGB) as comparison profiles now. In previous versions only printer profiles were supported for comparison. The Edit Primaries tool can be used to exchange, add and delete channels in a measurement data file. With ColorAnt 3.2 and higher it is possible to reorder the channels without changing the measurement data. One example is if you add Orange as a 5th channel and Green as a 6th channel to a CMYK data set. But later on you decided that the channel order should be CMYK+Green+Orange. Now you can simply exchange the channel order by using the pipets icon and selecting Orange for Green and Green for Orange from the same measurement data file without the measurement data changes. If channels are only reordered this will be indicated with adding ChannelOrder to the file name. Note: The channel reordering feature in Edit Primaries and the new Link tool Merge by Channel Name can be used combine multicolor measurement data from different sources. For example it allows to combine the four separate 4 color Esko Equinox files to a 7 color multicolor data set that can be used to generating profiles in CoPrA. The CxF3 file format has been supported since a longer time in ColorAnt already. 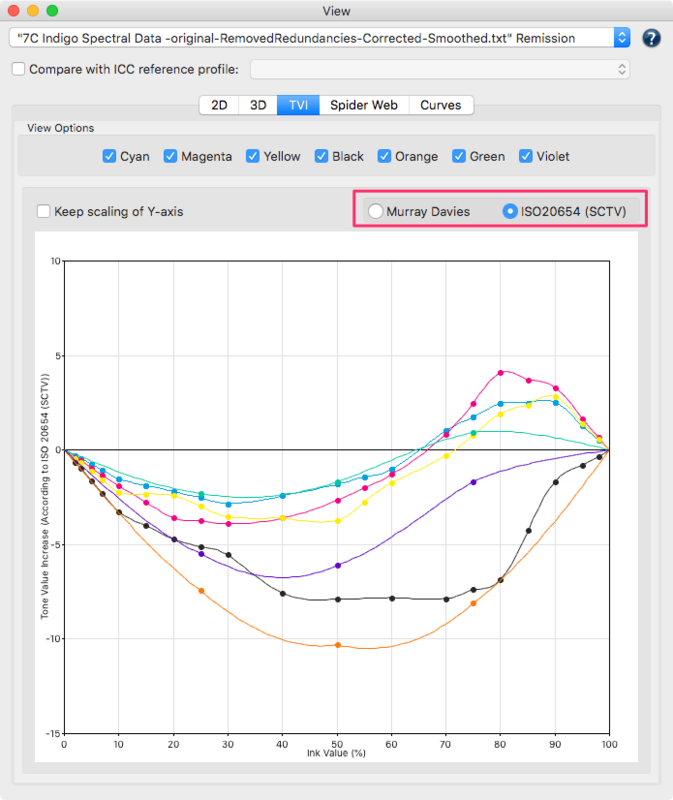 With ColorAnt 3.2 we support to load and display CxF/X-4 data for spot colors, too. Saving as CxF/X-4 is not yet possible in ColorAnt. Note: CxF stands for Color exchange Format. CxF files area vendor neutral format. CxF/X-4 is an ISO standard since 2015 and has been designed to define spot colors by measuring and storing spectral information of ink solids and tints, on substrate and process black. This spectral definition allows color management systems to better proof and reproduce spot colors. A new feature, Clear entries, has been added to the list File/Open Recent. ColorAnt remembers the last 20 files. With Clear entries they all can be deleted to reset ColorAnt if required. ColorAnt now supports the CGATS XML file format. The CGATS specification supports both a TXT and XML format and so does ColorAnt. 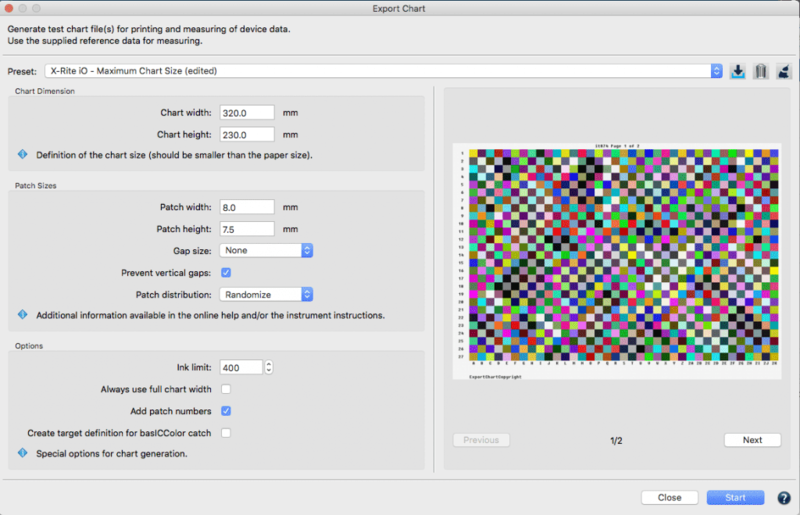 The tool Export Chart allows to save exported test charts as a TIFF or Photoshop PSD file and now also as a PDF file. 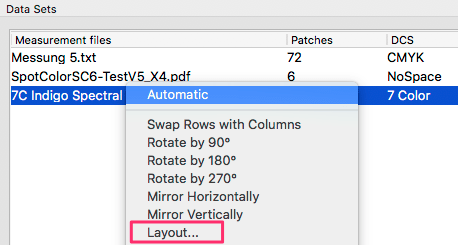 When exporting single page test charts with the Export Chart tool, ColorAnt uses algorithms to evenly spread the patches on the page. This may lead to a layout that does not use the maximum chart width. If you wish to force the usage of the chart width, you simply enable the new option Always use full chart width. The ICC Transformation tool now allows selection of an abstract ICC profile for conversions. Note: Abstract profiles are a special type of ICC profiles that perform a direct Lab-to-Lab conversion such as special effects or Lab modifications. All tools are now optimized in a way that the Start and/or OK button is highlighted. This allows application of a tool by hitting the enter key. A new version of the measuring tool UPPCT v2.3.3 is included in the installer. The new version fixes an issue with multicolor measurement data that was not transferred to ColorAnt or CoPrA. The CxF3 file format is predominantly used for exchanging spot colors. ColorLogic has improved the CxF3 import filters to be compatible with the recent ISO standard 17972-1:2015. In addition, a second ISO standard, 17972-4:2015, for the exchange of spot colors with tints. ColorAnt also supports the import of compatible with CxF/X-4 files. Note: Older CxF versions are no longer supported by ColorAnt. The White Correction tool is predicting the impact of paper white changes to the measured values of a test chart. With ColorAnt 3.1 there are three different methods to calculate this effect. ColorLogic Default is still recommended as the default setting. The two other methods available are ISO 13655 and Relative colorimetric. Relative colorimetric effects are strongest because paper white changes will modify the entire color space. In case of major changes in the paper white this will also massively effect the primary colors. The ISO 13655 method is still similar in the highlights and colorful primary colors to relative colorimetry. However, this method assumes that the shadows and very dark colors are not changed. The ColorLogic Default method, we proceed like in ISO 13655 and assume that the shadows are not effected and that there is a much lower impact on the primary colors. Due to our experience this corresponds more to the real observation. A progress bar has been added to the Edit Primaries tool to the display. When replacing the Substrate or Paper white, the change does not affect the primary colors. This is done on purpose, because the tool is intended only for smaller paper white changes from which the full tone of the primary colors would not be effected. For this reason, additional information will be displayed in the dialog. To make major changes to the paper white, we recommend correcting with the White Correction tool before editing the primary colors. Until now, only primary colors could be exchanged with other colors when the reference and measured values for the color to be replaced were present in the loaded data file. With spot color libraries such as the Pantone libraries, which can be opened as a CxF file in ColorAnt, there are no reference values. Therefore the exchange was impossible in former versions. 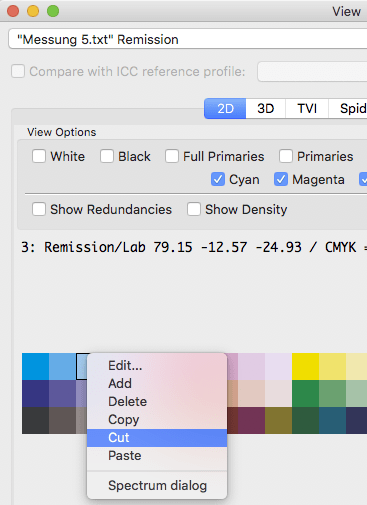 With ColorAnt 3.1 you can use these spot color libraries for the exchange of primary colors. Each spot color in the library is interpreted as full tone and can be selected to replace a primary color. Note: If only the full tone for the exchange of a primary color is available but no gradation values, ColorAnt will use the gradation behavior of the original primary color. A similar task to the reordering some third party tools save the measurements without the reference data. Without reference data, neither ColorAnt can work with the measurement data nor can CoPrA create an ICC profile. In order to combine or link the separate reference and measurement data files they must have the same patch count. Simply load both files in the Data Sets section select them and click the Link tool to combine them to one file. ColorAnt 3.1 enhances the capability to create and reorder test charts for 3rd party tools with the Swap Rows with Columns feature. By right clicking on the data set, six options are available. This feature will enhance compatibility with third party software. Note: Open the 2D-View to verify the results of the reordering applied. If there is an issue with reordering simply click the History entry to revert the data. Error message when trying to use the CIE Conversion tool have been fixed. When creating a single patch reference file with the Custom Chart tool a full tone will be created instead of 50%. The progress bar when creating a PDF report now more accurately displays processing time. Using Rescale tool in a previous versions to for small chart into a larger one, the linearity and TVI curves were smoothed. The curves will now closely match those of the original file as good as possible (depending on the fulcrums available in both charts). The selected rendering intent in the ICC Transformation tool will now be applied correctly. Third party measurement files with an unknown syntax will not crash ColorAnt. When an unknown syntax occurs, an error message will be displayed. Fixed file saving options.In the previous version only the TXT file format was accessible. Fixed viewing of some CxF3 files in 2D View. Now the patch name and Lab data is shown correctly. Fixed CxF3 import of a 3rd party CxF3 file with an unnecessary complexity. 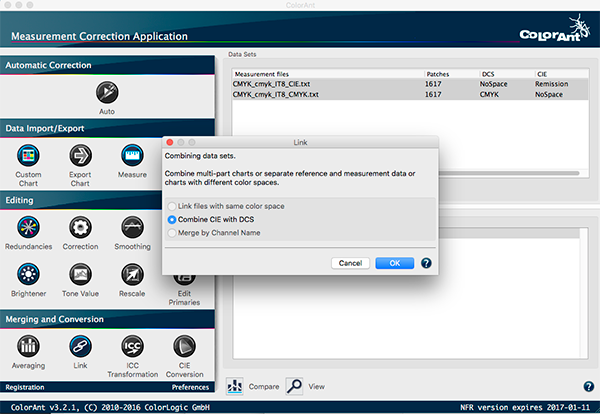 Improved performance for importing, viewing and processing of large CxF3 files without device data. This improves processing and viewing large spot color libraries with spectral data. Chart width in the two Presets we deliver in the Export Chart tool. This allows for better reading with the ruler of the X-Rite i1Pro. 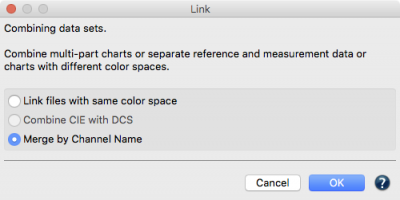 A crash when exporting multi page Multicolor charts with the Export Chart tool has been fixed. 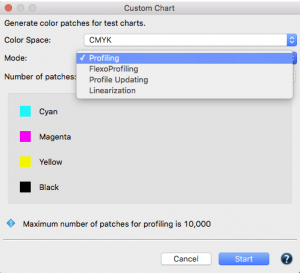 Optimized dark Patch delimiters used between color patches with non-CMYK test charts exported with the Export Chart tool. Now we do not use the color of the fourth channel any more but use rather darker colors needed for strip measurement instruments. Potential customers downloading ColorAnt and wishing to see which kind of features it offers can now do so without loading a license file. In certain dialogs a warning message may pop up telling the user that further actions can only be done with a valid license file (for example a demo license). Without licensing saving any files is not possible. Details on requesting a demo license can be found here. Issue with incorrect display of IT8 formatted measurement data files provided from third party instruments (e.g. multiline quoted values from Barbieri Gateway) have been fixed. Minor syntax errors in some third party files that prevented ColorAnt from opening them have been fixed. Now ColorAnt is more tolerant with such files and will open them. The incorrect channel names shown for the Multicolor test charts and reference files supplied with CoPrA after loading in ColorAnt and measuring with UPPCT has been fixed. Some memory leaks have been fixed. ColorAnt was not able to display measurement data when no system profile defined in the OS. ColorAnt will use a default conversion to display measurement data when no profile is found. Note: ColorAnt by default utilizes calibrated monitor profiles to properly display measurement data. ColorLogic recommends a calibrated and profiled monitor to enhance the user experience.